Obenge “high street” on a busy day. 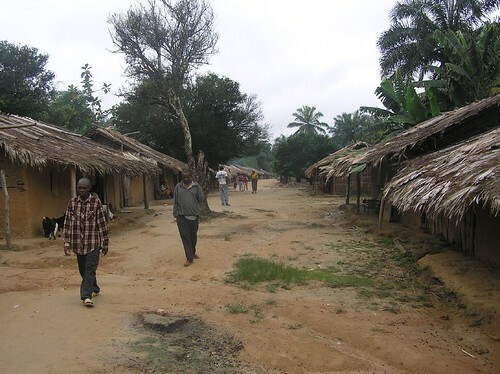 Obenge is the biggest village on the mid-Lomami which makes it a bushmeat capital for central Congo. John and I are in snowy upstate New York where we wait for the New Year to come round the globe. We are uneasy. Ashley just sent us a message from England written five clock hours closer to the New Year. He is uneasy. And we are in regular touch with Crispin who has now arrived in Kisangani. He, too, is uneasy. He is a couple hours closer to the New Year in steamy Kisangani. More importantly he is closer to the military. Will they help us ? What is the source of this “inquiétude” , of this disquiet ? the bonobo whose small range is already criss-crossed by poachers and whose “safe” islands are ever fewer, ever smaller. Up in the tree on the left. The bonobo nest the next morning. This time I will not show the laid out corpses…but only a hand so like our own and a foot so much more sure in the trees than our own. Lambert, who is still in Obenge, wrote : Colonel Thoms wife is bringing a load of munitions up the Lomami to Major Ranger. Major Ranger gathered the youth of Obenge and fired thirteen shots in the air. Lambert’s fear is the New Year. It is a time of major celebration in Congo. Money is needed for celebration. Ivory is money. 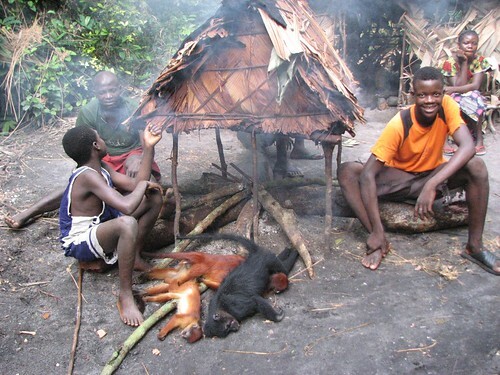 Most hunters, like these, in the Lomami forest are killing forest antilope and monkeys. 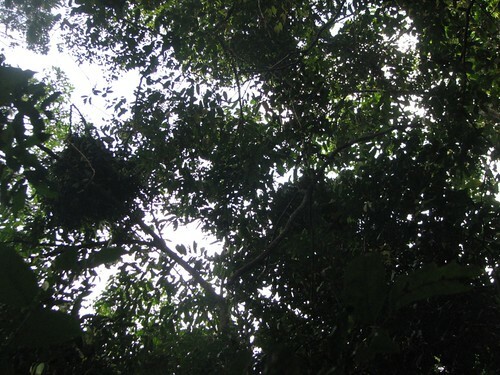 It is different to hunt for bonobo, the Congo’s own great ape, or the forest elephant. It is not only illegal to kill these but also malicious. 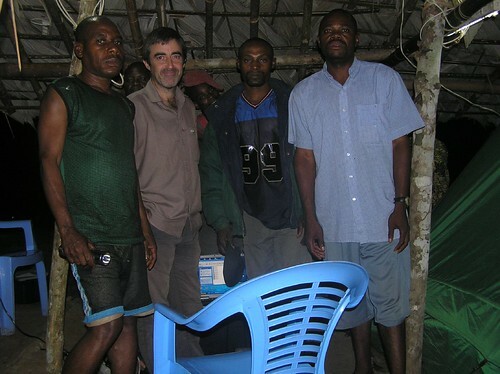 Crispin has been in touch with the military in Kisangani. They say that they will mount an “operation” to Opala and on to Obenge. A successful operation could stop major destruction before it is too late for the forest elephant of the Lomami and the bonobo of Obenge. We can facilitate this military mission. Their deployment is often delayed for lack of resources. We facilitated the last mission that got Colonel Thoms out of the forest with just 300 USD. Can you help us facilitate this one. This entry was written by Terese Hart, posted on 2007-12-27 at 6:57 pm, filed under Bonobo, Diamonds, gold and guns, Elephant. Bookmark the permalink. Follow any comments here with the RSS feed for this post. Post a comment or leave a trackback: Trackback URL. This breaks my heart into little pieces – I have nothing but comtempt for these people – and to gather little children to do their nasty deeds is inhumane – I wish I could figure out a way (a secret way) to wipe them out instead of the important and lovely wildlife they so eagerly destroy – they are truly an uncivilized lot of humans! Ugh…evil portents indeed. Hopefully the new year will finally bring peace, and perhaps some compassion to this area of the world. As always, thank you for your seemingly unending supply of courage and committment. Christ almighty. Words escape me. I am sorry but I for one don’t think that helping this Colonel – his wife -and all the children he can round up to kill bonobo and elephants celebrate the New Year in their typical Congo style will help a thing-this lot obviously is going to kill these innocent creatures at night when they nest (as if that is not bad enough to kill while they think they can nest for the night) but they will do it no matter what because they get their guns from somewhere be it Rwanda or wherever — stopping the treasure of guns and “munitions” is apparently all that can cut off their violence for a day or week or month! It is discouraging. What you say is true. We think we make an important move — get Colonel Thom out of TL2, for instance — and then we see all the ways that he and “his” can operate anyway. BUT THAT DOES NOT mean we can’t make a difference. WE CAN. But it does mean we have to mount pressure at a higher level and not think that a single action will turn the tide definitively. I see a long process and progress by small increments. BUT PROGRESS is possible, of that I am certain. ASH and the Major. We are always talking with the “enemy” and making it very clear what we “want”. Not pleasant…but we have to KNOW what they are doing through open talk and through “intelligence”…. I will update — promise. A quick update: information from Crispin in Kisangani is that Major Thoms is going to “brassage” or military “retraining” in Kamina on 3 Jan 08. That is very far away in Katanga province. Will let you know when it happens. Thanks, Terese. I seem to recall when Ash held talks with Colonel Tom, too, so the photo with Major Ranger didn’t surprise me. I’m pretty pissed off about all the dead bonobos and monkeys and elephants, though, so I’ll reserve my comments on what I hope happens during his military training. the red monkey in the picture above is a red colobus. It is an easy target for hunters, it’s an endangered specious. bonobos are the only known animals with empathy for other animals, they were watched playing with red colobus in the wild. a picture of the past? and its the end of another form of survival. i’m afraid our future looks bleak. Right about Red Colobus. Easily hunted and in big groups. 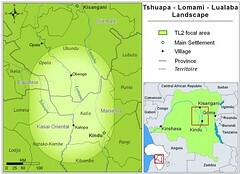 Our goal is a protected area in the TL2 where there is NO Hunting. Where bonobo, elephant, okapi and ALL species are protected. To achieve that goal we must be able to make a strong argument for a given area and know that it is the best area (ie good habitat for the key species and low human population) then we must lobby and seek funding to make sure that this protected area does not risk the status of Paper Park. We have a couple years to get there BUT must keep up momentum and pressure. I wonder how they (THE VERY BAD GUYS) cannot see as Michael said once they gone there is no more money – no more poaching for bushmeat — NO MORE ANYTHING – HOW STUPID OF THEM NOT TO REALIZE THEY ARE ENDANGERED AND THIS IS THE END FOR THEM! I think personally they just want the guns and power unfortunately the animals lives matter not in any way…it devastates me! Future perspective is very truncated, as Wanda says. More likely “If I can figure out how to survive and thrive today, well I can figure tomorrow when tomorrow comes.” This is a country without functioning insurance or pension plans. AND THANK YOU — THANK YOU. I just saw that the one time donations have been posted and we are all thrilled!! Thank you so much for all the comments. It is very frustrating for us all that the situation is like this. I assure you we are trying and going to keep trying to change this around once and for all. I really feel that once we get rid of these few difficult people this year that things will change there. I know from my experience in the village that we can work with the others and move forward. As one of you said if they kill everything then they are also finished. Please be patient and we will try and get good news for 2008 and I’ll try not to be in any more pics with these people. It makes me feel sick as well but sometimes you have to know your enemy to defeat them. Also remember this is a chaotic country so everything takes time. Not an excuse but reality. Yes thank you also for the donations. It is not the amount that is important from my point of view but the fact that people around the world are showing that they care and are willing to do something in their own way. It gives all of us out here courage and determination to carry on. Great words of encouragement — I feel better already Ash — Happy New Year! Theresa, this is a wonderful,hopeful way to start the new year. 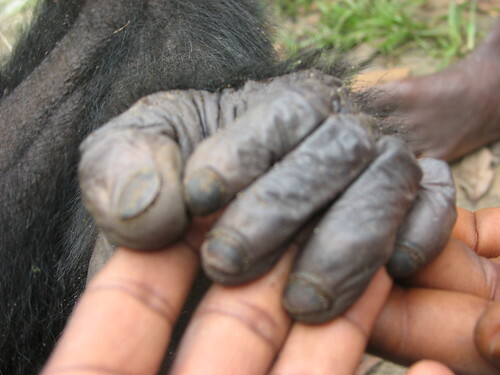 Everyone’s generosity at the end of 2007 and beginning of 2008 will be put to making TL2 and the OBENGE forest a safe place for bonobo. Our new year’s resolution is to build the collaboration and the action needed. Dr. Hart, Here’s a pleasant thought…can you imangine the bonobos seeing orangutans?! Who would imitate who? Yes, I know they are continents apart, but I’m always so fascinated how different species of primates interact with each other! By the way I’ve joined your monthly donation plan, your work is just too important to ignore…looking forward to future posts! Again thank you, Theresa. Actually one of the mysteries of the TL2 area is reports that both chimpanzee and bonobo existed in some areas. If so we have not found those areas, but certainly to see how and IF they interacted would be fascinating. Yes thank you Theresa. That is wonderful news. When we get out to DRC again soon I will let you know exactly how your money has been spent so you know it has been put to good use in the field. I can tell you John, Terese and I along with all our Congolese workers are really fired up to make this work and make 2008 such an important year for this area. It is hard working here and also bizarre most of the time but it is also SO IMPORTANT that we are not going to let Maj Rang stop this project or anybody else. We will turn it round and really make a difference. Oh and happy new year to you too Wanda of Atlanta. Interesting how many women make comments and donations to our blog. I wonder if you have a better understanding of these things than us men!! Thanks Ash — look forward to 2008 and all you guys do! It isn’t just a matter of making laws. You have to teach these people another way of life. To someone that lives here, monkeys and apes are vermin and are either a source of food, or vermin that destroys crops. In India a monkey took a human infant to the roof and threw it off, killing her. No law is going to make any difference to that mother or father. It goes much deeper. I have seen countless “road side monkey tricks”. You can’t just outlaw these, you have to show this man another way to support himself and his family. You have to put in the time and money to give these people a different way to live. I have looked into the eyes of farmers that have had to make the decision to either sell his daughter, or to turn his son out because monkeys had destroyed his crops. He can’t just go to the market and buy more food. If people in the USA have mice that get into their fivebucks coffee, they put poison and kill the mice in such a painful way they go insane and run in circles, and that’s OK. 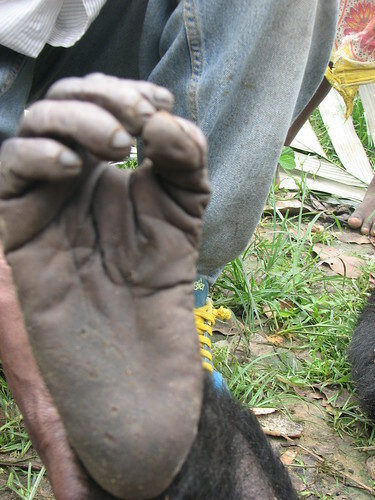 If a man kills an ape or monkey to feed himself or his family, that’s terrible. It depends on where you were raised. If you give these people solutions instead of laws, you have made a friend and not an adversary that will figure out how to get around the law. They need help to understand that the torture and killing of monkeys and apes is not a way of life anymore. People who sit in an air-conditioned office and tell the man on the street who has a “performing” monkey he can’t do that will carry no weight with that man. To tell him it’s a bad thing to tie a macaque up and make it stand with its hands tied behind it’s back for up to 10 hours a day, doesn’t mean a thing to the guy. To him it’s just something he has learned from his father. It’s the only way he has to make money to eat. The big labs that use animals to test products will continue to do so as long as there is money to be made. If you hit them in the pocketbook, then they will stop when it’s not profitable anymore. Even the resort in Florida that has monkeys on it trapped and sold 350 of them to a lab because there was too many of them and they started to be destructive. We have to work together and stop all the abuse to animals, no matter where it pops up it’s ugly head. Just making laws is no solution.